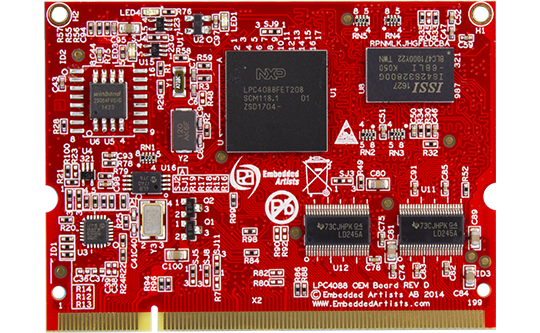 This module with NXP's LPC4088 microcontroller is a suitable upgrade from the LPC1788 OEM board. It offers a digital signal processor and floating point unit that help improve the performance of numerical algorithms. The module also offers connectivity such as Ethernet and dual USB 2.0 interfaces. Compact form factor, 68×50 mm, using the proven SODIMM connector. The LPC4088 OEM board is available in industrial temperature range, -20 to +85 Celsius. The industrial (temperature range) version is suitable for always-on applications.